UNIFY touching Taiwan, Finland, Papua New Guinea, Peru, Argentina and Ecuador! 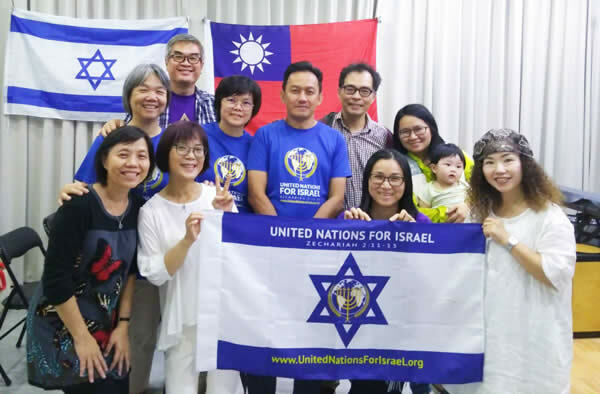 In early December 2018 they hosted Malaysian Pastor Dawid Yosef Lee (center, in blue UNIFY T Shirt) in Taipei. Two days were spent sharing the importance of coming out of Replacement Theology, of grafting into the olive tree of Israel, and of embracing Yeshua and His brethren the Jewish people. Other essential principles on holy giving and the Feasts, from Archbishop’s comprehensive book Grafted In, were presented. There was emphasis placed on joining UNIFY also to see Taiwan become a Sheep Nation, standing united with Israel. The congregation was told that “faith without action is dead”, and we are happy to report that just a week after this trip 5 people joined GRM Bible School! Praise Yah for His leading! Our Finland Team have continued our monthly visits to our capital of Helsinki. During the latest visit we especially prayed that the presence of the Holy Spirit would surround our re-born Parliament members. We declared that they will be raised up. Elections are here in Finland in April, just like Israel has, and we decreed that righteous leaders will arise – those that fear more the Word of YHVH than general opinion or globalization. We prayed that the love for Israel and understanding of Israel’s importance would go to a new, much deeper level. We also participated in a Parliament discussion meeting, which was organized by Christian Democratic Party & was open for audience. It was concerning the Trans-Law, which has been demanded by Seta and Trasek, the leading organizations for LGBT community. Opening speech was by Tapio Puolimatka, a new-born Christian and nominee for Parliament this year. Also many strong Christian Democratic women were present and we heard about issues that are totally opposing the Word of YHVH, as well as “common sense”. Prayers for wisdom to all speakers and listeners continue, pleading for Yah’s mercy so that these things would not be legalized. We also attended the March of Life in the small city of Mänttä-Vippula, marching with Israeli flags, our UNIFY T-shirts under our very thick jackets (it was -26C degrees) and were blowing our shofars. After the march all attended the Holocaust memorial meeting, where the leader of the city was also present. HalleluYah – May He be glorified in Finland! In November we had a visit again by another group of young Israelis. This is now the 4th time we have had visits from young Israelis who have stayed at our home in Port Moresby. Their visit to Papua New Guinea takes them into the Provinces (even to the most remote places, villages and among locals) tasting fresh vegetables from the gardens — they love the remote places more than the cities! They live with the village people, learning as much as they can. By the time they come back to the city of Port Moresby, we then have time to also spend with them, to bless them and send them off back to Israel. It was such a blessing to have them with us! FIRST FORMER PNG MEMBER OF PARLIAMENT BECOMES A GRM STUDENT IN PAPUA NEW GUINEA: Ms. Loujaya KOUZA, former MOROBE Member of Parliament, becomes the first former Government MP to become a GRM student in Papua New Guinea. She resides at my Ministry Home office and is doing GRM, enjoying the depth of these studies. Ms. Loujaya unbelievably finished her Level 1 in just one month in November and is now on her Level 3. In her own words “I would like to go out and evangelize more disciples once I finish” May YAH bless her and reward her. She passes her great words of gratitude and thanks to her Israeli Ima and mentor Archbishop Dominiquae Bierman and Rabbi Baruch Bierman for accepting her in Eilat on one of her Government visits to Israel. Peru: We have many teachers that are now taking GRM – they will in turn interface with numerous more teachers. Praise Yah for opening doors to our education system! Mendoza, Argentina: the UNIFY flag was planted (by the son of a UNIFY member) on the mountain summit of Aconcaqua — at 6,960.8 metres (22,837 ft) it is the highest mountain in both the Southern and Western Hemispheres. Believing for more and more Sheep Nations! Ecuador: As the UNIFY message is being shared and is spreading, a wave of favor is coming: now Pastor Marcello is being invited to events linking pro-Israel groups in Ecuador. Also, after holding a Youth Retreat at the end of December, we now have more participants coming on Tour to Israel at Shavuot. To National Delegates: Consider organizing a weekly Prayer Conference Call with your nation’s UNIFY members, specifically to address the unique situations facing YOUR nation. (This is in addition to your continued faithful participation in our weekly Global Midnight Watch.) From these calls can birth creative strategies as you join with other UNIFY Team members in your nation. It can help us all get to know each other better and also produce greater impact at rallies, parades, etc. We are in the process of building a powerful TEAM: Together Everyone Achieves More. Remember to also take advantage of all social media outlets to share messages/videos that Archbishop Dominiquae and our Team produce. These tools can reach multitudes of people around the globe that may not be reachable any other way! Your continued monthly support of UNIFY helps assure the success of all of our efforts worldwide, including upkeep and maintenance at our Embassy. Thank you for remaining faithful to the vision! Upcoming nationwide Purim celebration: UNIFY Papua New Guinea with Israel, beginning March 19 – 22. UNIFY Bread – marketing plans to come to fruition. Membership from all nations to increase – and for our current members & Delegates to create a personal Action Plan for 2019 to further the vision. Embassy safety — and for all operations to be done with integrity, for His glory. May those gathering there experience His deep love and desire for true shalom in Israel. Sukkot Tour 2019 — Uniting Nations for Israel: Ruth and Naomi. Financial blessings to come to all who are stepping out in faith to participate. Upcoming trip of Archbishop accompanied by Jan and Pastor Terhi to a new nation in West Africa called Equatorial Guinea where there are also descendants of the Sephardic Jews and UNIFY will be presented for the first time. © United Nations For Israel Inc. | All rights reserved.